Current Member's Annual Dues payment via PayPal at bottom of page. Do not complete the on-line Membership form to renew dues via PayPal. Credit cards can be used with Paypal. New membership is open to any member of the motion picture industry in Canada, or any associated company or supplier connected to the motion picture industry in Canada. If you are applying for membership separately or as part of an event or to a Branch, you can fill out the membership form and submit without using PayPal link to make payment at this time. 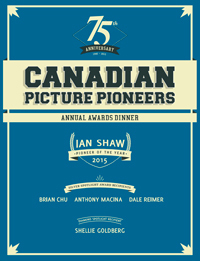 If you would like to make an optional donation to the Canadian Picture Pioneers in the same transaction as your dues payment, just "Click" on the "Continue Shopping" link on the Shopping Cart Page and return to Pioneer web site and select a donation amount to Add to Cart.